A team of five SIU business students recently earned second-place honors in the St. Louis regional competition of the Chartered Financial Analyst Institute Research Challenge. 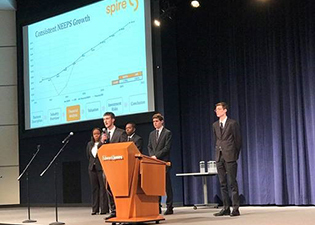 Members Sam Drever, Aaron Goeckner, Courtney Lucas, Jace Muselle and Anthony Reed competed in the event, which gathers together students, investment industry professionals, publicly traded companies and corporate sponsors for a real-world competition. The goal of the competition is to promote best practices in the equity research and company analysis. During the competition, students research, analyze and report on a company while they are practicing their analysis. In addition, the students are held to a code of ethics through the CFA Institute. This is the second year that the team has competed in the challenge, and SIU’s team ranked higher than other local universities, including University of Missouri-St. Louis, St. Louis University and Washington University. The competition began in September; the local champion, which was determined in February, will advance to the regional competitions in April. The SIU team’s company was Spire Inc., a natural gas utility based out of St. Louis. The team’s coverage of the company consisted of a written report that provided an opinion on whether to buy, sell or hold shares of Spire. The team members then defended their opinion by presenting to a panel of industry professionals. To participate in the challenge, each school is allowed to enter one team that consists of five business and finance students who work directly with the company in researching and preparing the analysis. Each team is assigned a mentor who has equity analysis experience. The teams then submit a research report on a specified company and conduct a final presentation in front of a panel of judges consisting of high-profile CFA members from the regional chapter. SIU’s team was mentored by Edward Jones senior analyst and SIU Carbondale alumnus Matt Arnold, who has been with the firm’s research department since 2004. Arnold, who began his career with Edward Jones in 2000 in the equity sales service department, is responsible for coverage of stocks in the industrial and materials sectors and has been featured in the Wall Street Journal, Forbes, Barron’s, Bloomberg, the New York Times and the Chicago Tribune. In addition, he has appeared on CNBC, Bloomberg Television, BNN and National Public Radio. Timothy Marlo, clinical assistant professor of finance, is the faculty advisor for the Saluki Student Investment Fund (SSIF) and assisted the team in preparing for the competition.